The University of Illinois at Urbana?Champaign had the highest number of sections of the 2009 Uniform CPA Examination passed by first?time candidates without an advanced degree, and the University of Missouri at Columbia claimed that spot for the most candidates with advanced degrees, according to NASBA’s Candidate Performance on the Uniform CPA Examination ? 2010 Edition. Wake Forest University had the highest passing rate among first?time candidates without an advanced degree who passed all sections. The data from the four 2009 Uniform CPA Examination testing windows were analyzed by Allan S. Cohen, Ph.D., University of Georgia, and James A. Wollack, Ph.D., University of Wisconsin. 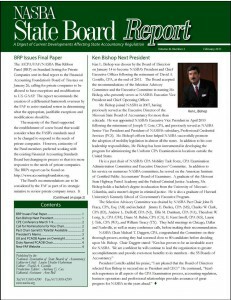 Each State Accountancy Board will receive a copy and others may purchase it in print or on disk through the NASBA Web site. The book is available at $130.00, the CD at $75.00 and the book/CD combo at $180. In 2008 there were 228,509 total testing events, up over 21,000 events from the previous year. 2009 saw an increase of nearly 19,000 events, bringing the total up to 247,364.